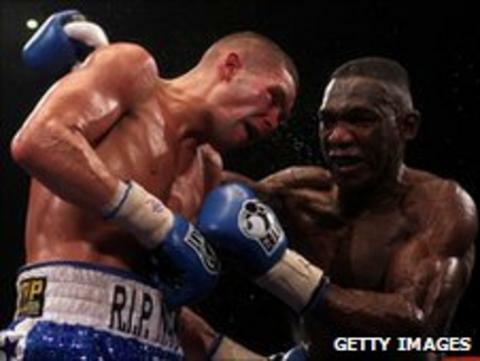 Liverpool's Commonwealth light-heavyweight champion Tony Bellew has denied taking drugs after fellow boxer Ovill McKenzie accused him of doping. The pair are due to fight on 16 July in a rematch of their bout in December. "He said I'm on drugs and I'm amazed he could come out with such a statement," Bellew told BBC Radio Merseyside. "People say things that get taken out of context, but there is no taking out of context what he said there. He's made some pretty bold accusations." The first meeting between Bellew and McKenzie ended in an eighth-round stoppage in December, with the win going to the Liverpool boxer. This was after McKenzie had knocked his opponent to the ground in the first and second rounds, and Bellew admits it is something he is constantly reminded of. "He's said he's hit me with the best punch he could hit me with and I just bounced off the floor," Bellew continued. "He said the only time people bounce back after punches like that is when they're on drugs. "I'm the cleanest athlete in the sport. I've lobbied and protested for quite a while that we should have Olympic style drugs testing in the sport. "I'm a firm believer of that. There should be blood doping and testing to the highest level in Britain for professional boxing." McKenzie insists his words are not just pre-fight hype and he believes Bellew has something to hide. "I honestly believe if he's not on drugs, he's on something," said McKenzie. "I've watched that fight over, before he touched the floor he was knocked out. "Then he jumped up swearing at the referee saying 'I'm alright'. Then I see him at Nathan Cleverly's press conference shouting and wanting to start a fight. "He's always acting like a maniac or somebody who's not normal." You can hear more from Bellew and McKenzie on BBC Radio Merseyside 95.8 FM, 1485 MW and DAB on Tuesday, 14 June from 2000 BST.